Resource planning is an effective remedy against causes of project failure. For resource planning to be effective and efficient, you need a strategy. Before we get to all that, you might ask what's resource planning. Resource planning is the act of allocating and utilizing resources (people, machinery, tools, rooms etc) to achieve maximal efficiency of those resources. 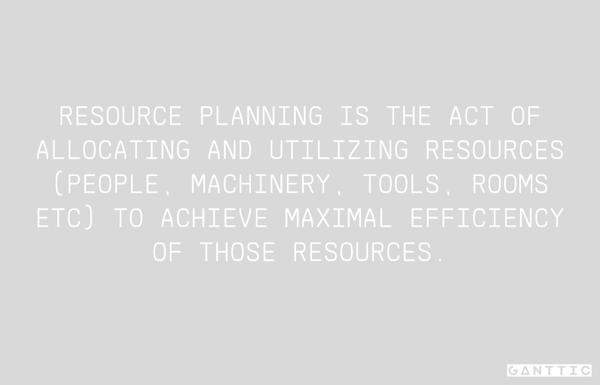 That's the official resource planning definition. In the real world, resource planning is often simply something a project manager does to know who's doing what and where things are. Meaning it's often resource management using Gantt charts to get an overview. Now, enough about the resource planning definition, you are here for the infographic and strategic resource planning. 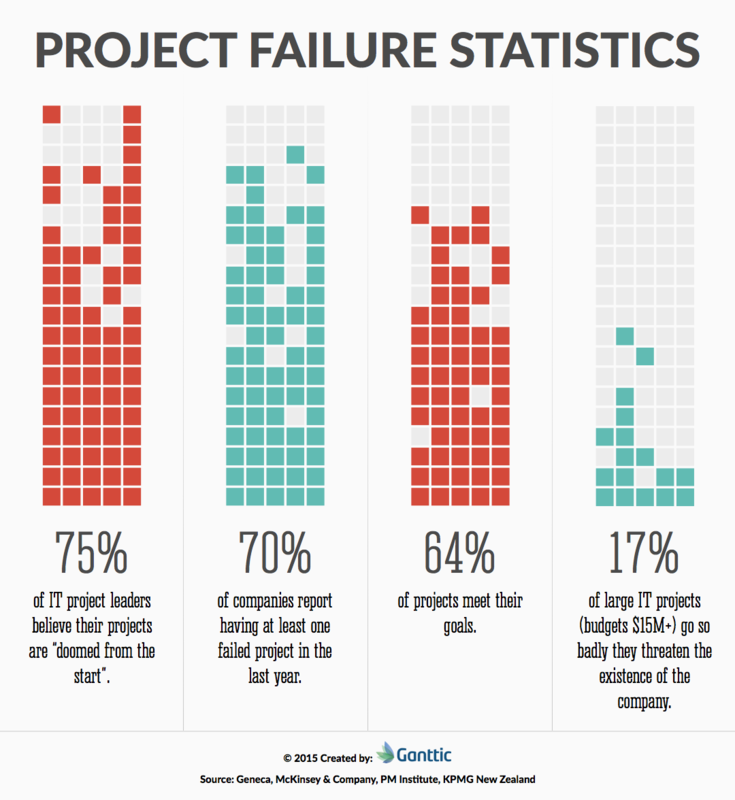 The infographic shows important project failure statistics. 75% of IT project leaders believe their projects are “doomed from the start”. 70% of companies report having at least one failed project in the last year. 64% of projects meet their goals. Before we go on, it’s important to know that there is absolutely no reason to put in millions of dollars just to end up a failing project. With proper tools for resource management and project planning, you can eliminate the 17% of large IT projects going so badly that they threaten the existence of the company. As discussed in the previous post on the limitations of spreadsheets, here we will illustrate how resource management solves those problems and how to use these solutions to your resource planning strategy. Taking an example element from each category, when a leader plans, the strategic move is to understand that plans change and to prepare for it the best way possible. 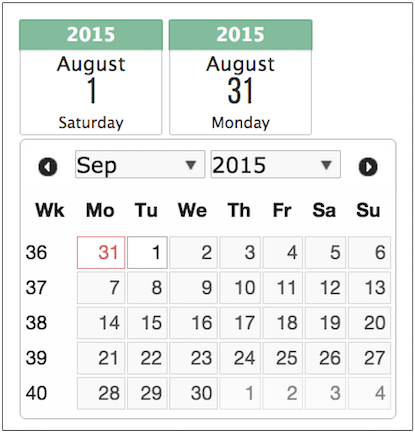 The date picker feature allows you to save time when selecting a time frame. In Excel, you are wrestling with cells, having to format data type, having to cut and paste and work your way around merged cells. This is an excellent example of the great things that Excel can achieve, but because it’s meant for too many purposes, the process is much longer than necessary. With an intuitive date picker as shown above, where you literally only click twice to achieve your goal (right after the start date is selected, the calendar for the end date pops up intuitively). Also paired with a flexible timeline in which you can zoom in and out of a time period, you are looking at an accumulation of hours saved in your resource planning efforts. These views tabs bear a resemblance to browser tabs and this is because it is meant to provide similar convenience as well. Remember the sheets? Well, there is no longer a need to copy and paste the entire sheet, go through tedious customization changes to view your data from another point of view. With these views tabs, you can utilize custom data fields to have your resource data listed in multiple ways. 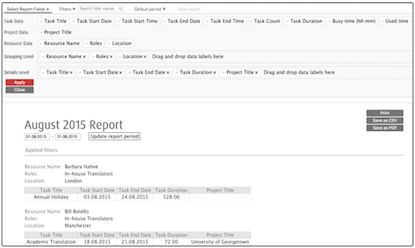 In the screenshot above, the same set of data is sorted by location, sorted by roles, sorted by projects, unsorted, meaning all resources are shown and you have a report view as well. You can easily allocate resources to multiple ongoing projects without overbooking anyone. You can view one project at the time or the whole portfolio. The combination of views is endless, and so is your convenience. Have you ever tried viewing an Excel sheet on mobile? What about editing data on a tablet? We’re all grateful for the invention of the touchscreen, but mini spreadsheets cells and touchscreen just don’t quite go together. Let’s not even get started on the nightmare of trying to file-share a spreadsheet. The solution for instant accessibility on the go is to utilize the technology that you are already using for your daily life - Google Calendar. Once Roger in the screenshot above syncs all the Gantt charts to his Google Calendar, he is able to access his plans from his mobile or tablet calendar app, even without internet connection. While it’s not exactly Google Calendar Gantt chart, it is the easiest way to have your work plans reachable in your pocket. We need our data for a variety of purposes. For a client meeting, we don’t want to end up sharing our entire clientele data. For a board meeting, we want to present the important numbers instead of Bill’s social security number. While Excel allows you to save your data in many file formats, you are not able to extract the data that you need without having to do it manually. But with an intuitive resource planning software, you are looking at simple drag and drop of the type of data for your report. Now all you have to do is to give yourself a pat on the back for all the time that you have saved from not customizing reports the stone age way. When you are using spreadsheets, you are vulnerable to a whole list of possibilities of losing your data. On top of corrupted files and viruses, you are also looking at the potential loss of your devices, which may lead to unbacked-up files being lost as well. Having your data on the cloud is more than just convenience, but it is also addressing the security issue. As seen in the screenshot, the very same green lock appearing in bank websites and government websites means that you have a secure connection. Having a secure connection also means that the site’s certificate is valid and its identity has been verified by a trusted third party. You can be sure that you don’t have to worry about data theft. For businesses, Microsoft charges a sum per user per month regardless of usage. At Ganttic, the cheapest plan we offer is free. A free resource planning software, anyone? You can have an unlimited number of team members using the plan, have an unlimited amount of projects, reports, views, and tasks. As long as you are only planning ten or fewer resources, your plan is free forever. This is to support small and medium businesses and only charge for what you use. When your business starts to grow and you need to upgrade, the price that you have to pay for Ganttic is way less than what you have to pay for Microsoft Office for resource planning. To start executing the 6-step resource planning strategies from this post, sign up with Ganttic here and try it out for free for 14-days.